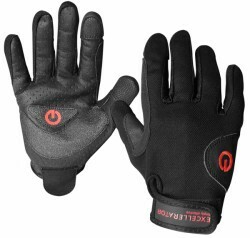 The Excellerator training gloves Street are your ideal companion for each strength training. The Excellerator training gloves Street are made of genuine leather with reinforced edges and a silicone grip control. These features make the Excellerator training gloves Street extremely sturdy and durable. Due to the perforations of the Excellerator training gloves Street and the guaranteed moisture transport, you can start your outdoor training. Due to the touch pad function, you can easily use your smart phone even while doing your training sessions.